College Bribery Enrollment Scandal Misses the Simple Math Solution. The entire College Bribery Scandal seems to be another adventure in pointless class envy that everyone will take way too seriously, and could send some parents to jail. Or the Feds will use their Checkbook Justice Mafia to fine rich people so they can fund the Treasury. None of what is going to happen will help the people who need it most, Middle and Lower Income class kids who want a chance to attend a prestigious University. I don't care how much the College bribes were. What I don't understand is why couldn't the Ultra Wealthy Parents simply pay into a College Scholarship fund that would give less affluent but deserving students a free ride? If a Parent is willing to pay a 1/2 million dollar bribe to get a Daughter or Son into a prestigious college, and then pay the tuition for their own son or daughter on top of that bribe, why not just create a special fund in which Affluent Parents donate a 1/2 million dollars so a certain number of other kids get a free ride to the college, and their own kid gets to attend as well as long as they pay for their tuition. While law and order will bellow that bribery is against the law, why isn't lack of common fiduciary sense against the law? If there are people out there willing to make extraordinary payments to ensure their kids get into a college, then just let them make the payment directly to the college so less wealthy families can benefit. Imagine if a half a million dollar bribery check had been split into ten 50,000 dollar scholarships. Would anyone really care that in exchange for that tremendous donation, the Donor could then pay the regular tuition price to have their own child admitted to the College? In the absence of this common sense approach, I am hoping a Judge will see through the entire Federal Scheme to shame people who should have first been given the opportunity to make a significant donation to the school so those less wealthy could attend in exchange for the privilege of then paying full tuition price for their own child's enrollment. 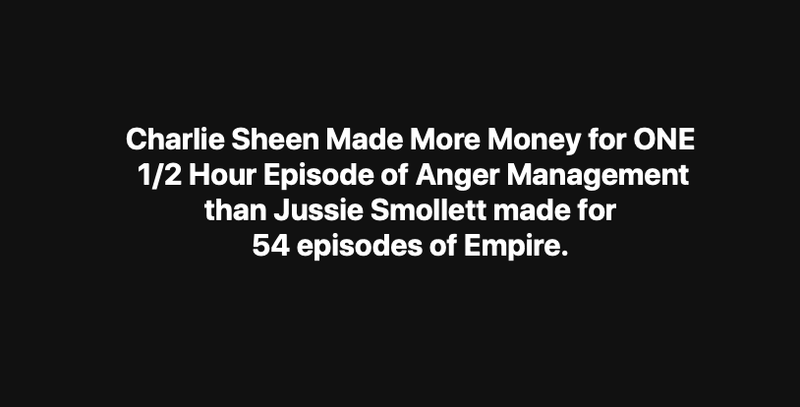 Charlie Sheen earned more money from ONE episode of ANGER MANAGEMENT than Jussie Smollett's Total Salary for his first three years on EMPIRE. Jussie Smollette is the victim of Financial Abuse by Fox. Charlie Sheen was paid more for ONE episode of Anger Management (2 million dollars), then Jussie Smollett's total salary for his first three years on Empire, around 54 episodes. Both shows were created for Fox. Smollette started at 20,000 per episode but it is proving difficult to find a year by year Salary for Smollette. Newsweek did a story in October of 2016 about African American Actors being paid too little compared to Caucasian actors, even when the African American Actors are on a show that is getting better ratings than a Caucasian Actor's show. In October of 2016 Newsweek was reporting that Smollette was still being paid 20,000 dollars an episode. Huffington Post reported Smollette was making 65,000 per episode for this past 2018-2019 season. The Problem is that a 20,000 dollar starting Salary meant any raise would look significant and generous based on percentages so it may have taken Smollette several years to finally get to the 65,000 per episode mark, which for a four year actor on the first or second highest rated show on Fox, and the show is an hour long, is still well below where the salary should be. If Smollette had been paid based on Empire's rating's popularity, his Salary for this past Season should have been at least 100,000 per episode instead of 65,000. But just as importantly, the initial low salary creates a negative cascading affect in which each year's raise still keeps Smollette below what he should have been being paid all along. It may be safe to presume that Smollette was basically underpaid by about 20,000 to 30,000 per episode over the life of the show, presently 74 episodes. That's around 1.5 to 2.3 million dollars of underpayment Smollette never got. Smollette was taken advantage of by the same Network that paid Charlie Sheen 2 million dollars per episode when Anger Management hit its 100th show. However, Sheen was still making 1.8 million prior to the 100th episode of Anger Management. It appears that Sheen's behavior, which included Drugs, Drinking, Prostitutes and eventually acquiring HIV and possibly sharing his HIV with others did not deter Fox from paying Sheen 2 million per episode for Anger Management. Even if the HIV news was after the Series Anger Management had concluded its run, the other unruly behavior sure didn't seem to have any type of negative affect on Sheen's salary. Were the Female co-stars on Anger Management underpaid? Sheen may have gotten his female co star Selma Blair fired when she questioned his work ethic. When will Fox be investigated for their Contracting Practices that could be the equivalent of Financial Abuse for Minorities and Female Actors? 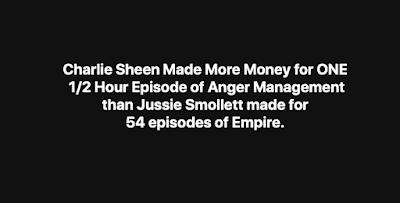 Although Smollette was a co-star on Empire and Sheen was the Lead on both 2 and 1/2 Men and Anger Management, the disparity between what Sheen was making per episode to what Smollette was getting per episode over the first year or two was a remarkable 9,000% to 10,000% difference. By the end of year four the percentage difference might have been reduced to perhaps 3,000% to 4,000% difference. It's not as if Smollette wasn't talented. Compare Smollett and Sheen's Singing abilities...This is Charlie Sheen directly below. How Can Jussie Smollett compete with Charlie Sheen? Simple Math Detective is concerned that it is in Hollywood's best interest to keep the pay disparity between what Smollette should have been making and what he was making a secret and instead go with the Narrative that Smollette may have behaved criminally. I get that what Smollette is alleged to have done can be construed as illegal, but it seems that years of being underpaid, aka financial abuse, took its toll, and I hope that part of the Smollette Story does not continue to be obfuscated by the Media. Meanwhile, Charlie Sheen attempts to rise for the third time. 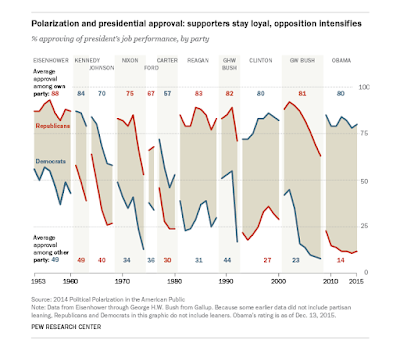 A Presidential Popularity Puzzle for you to Figure out. There is one President in the Presidential Chart Below that is different from all the other Presidents, can you find it? Hint, It is not about how long they served as President. You can find the original chart and story here. Simple Math could solve the Student Loan Debt Crisis in the United States. Welcome to the world of Simple Math. There aren't that many out there that advocate solving problems with simple math because anyone who is respected or has a respectable job has to have a solid foundation in complicated math. One key to solving the Student Loan crisis is to understand why change is not happening. Change and resolution in the Student Loan crisis is not happening because of two relatively simple rules that control what politicians will and won't do. Rule Number one is "The Promise to Pay". These four little words protect the money world from all kinds of tricksters and people who otherwise would not pay. Rule Number two is a bit more heartless but probably exists because "The Promise to Pay" exists. Rule Number two is, "No Debt shall be modified unless a Default is Declared First". Please take a moment and let that sink in. "No Debt shall be modified unless a Default is Declared First". In case one wants to disagree and say, what about a home, people refi all the time. Sure, the equity in the home allows for interested parties to pay off the first debt, and then come up with a new debt plan. Whereas debt that has no equity backing it has no way to be paid off so the only way to come up with a new debt plan is to declare a default on the first debt. However, The Simple Math Detective believes there are ways to peacefully coexist with the both the Promise to Pay and Restructuring a Debt without Declaring a Default, but it will require politicians writing new and passing new laws. Simply put, Simple Math Detective believes that certain rules and guidelines could be incorporated into existing Loan laws that would help emancipate millions of student loan debtors without giving them instant freedom, but rather freedom from their debt earned over time. Here are exclusions that would allow the Restructuring of a Debt without having to declare a Default. Exclusion Number 1. Cap all student loan interest rate charges at 100% of the value of the actual loan. If a Student borrows 50,000 dollars, the most they can be charged in interest is 50,000 dollars. Once that figure is reached, the remaining debt is paid off with no more interest being charged. Exclusion Number 2. Eliminate all future Interest Rate Charges once a Student Loan has aged a certain amount (to be determined by a think tank). Exclusion Number 3. Eliminate all future Interest Rate Charges after a certain amount of time if a Student maintained a C Average, or had excellent attendance, or had a major medical issue for themselves or had to commit to taking care of a family member. Even with these incentives added in, it would be important to not penalize students by making the monthly repayment terms so high that they default on the freezing of interest rate charges going forward. While these Exclusions could result in less money available for Student Loans, or perhaps the Interest Rates on new Student Loans might go up, the Interest Rate caps ultimately serve the same purpose, they prevent scenarios where Students keep making monthly payments to their Student Loans but the Loan debt actually increases. Lets keep in mind that this concept is a compromise to Student Loan Debt Forgiveness, and doing nothing. Welcome to Simple Math Detective. Welcome to Simple Math Detective. Sometimes the best solutions involve understanding simple math.